I wasn't in a mood for knitting in the last few months. Nor did I check much of my mail. 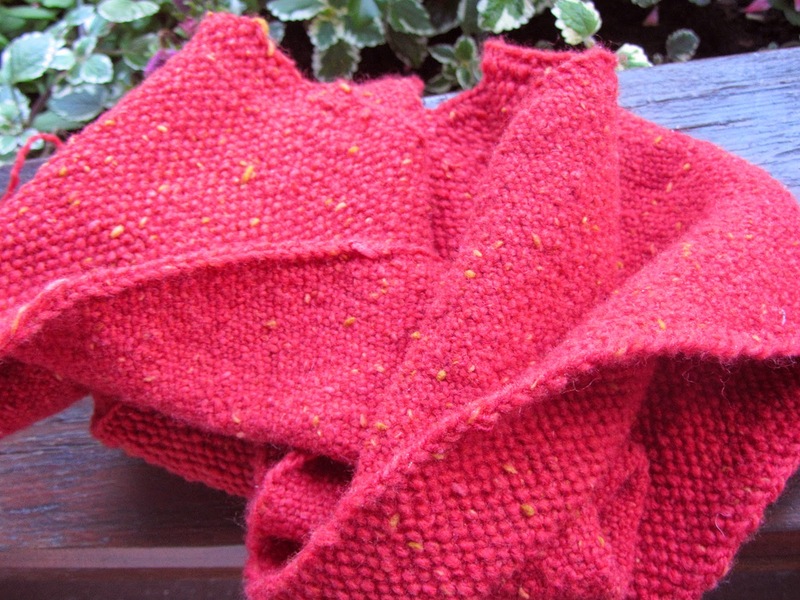 Yet, one day I did check mail and saw a newsletter or handful from DBNY, checked what was up and discovered a batch of Cashmere Tweed in a colour I call carroty red; slightly orangeish shade of red I just don't like but it's totally my mom's colour. My mother, as it has been noted repeatedly, disagrees with knitting. And I, being the silly naïve person, keep trying to persuade her that there's nothing wrong with hobbies. Lately, she's been complaining a bit less about my ever-present WIPs around the living room so I decided to go for it. And, everything can be redyed to black. The yarn arrived, I showed it to mom and said that if she wants, I can make her a scarf because I thought she'd like the colour. She agreed under the condition that the scarf be tasteful. I decided for linen stitch which is obviously tasteful and it doesn't look obviously knitted. Not sure what mom will think, should she whine, I'd get pretty pissed because this yarn is pain in the arse to rip and there's no way in hell I'd wear a red scarf. More knitting content to be expected. More content at all may be expected.